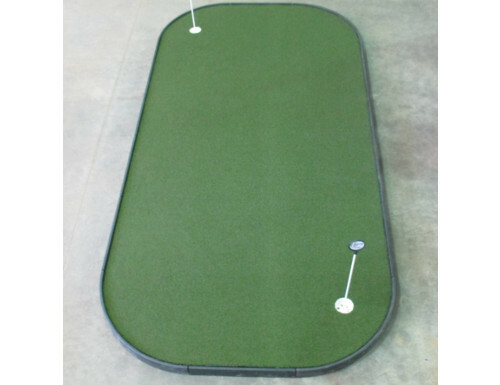 These golf putting green mats are made of high quality synthetic turf materials coupled with a pro tour link base. The turf material is made of Northeast Bat Grass, with a ½” pile height. Golf Putting Green Mats are the perfect practice aid for the golfer who doesn’t have a lot of space but still want to keep their stroke sharp. This kit can be assembled and ready to go in 5 minutes. The base is constructed of tour links panels and the putting surface is our top of the line Northeast Bat Grass, 1/2″ pile ht, cross stitched nylon surface. The green can be easily transported for indoor and outdoor use. Use it by the pool in the summer and move it to the Rec room for the winter. This is a great gift for the golfer who has everything. The game of golf is won on the putting green. If you’re like most people, it’s difficult to find the time to work on your short game. The truth is, you only need about 10 minutes a day on your chipping and putting to achieve positive results. Practicing your putts on a cheap green carpet, will help you as much as putting on an old shag carpet into a coffee mug. 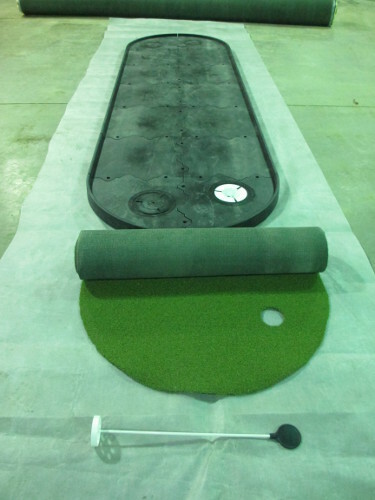 Custom Turf Outlet’s Artificial Putting Greens are engineered for a true roll with minimal bounce. Our putting greens have a natural look, roll and bounce that is similar to the greens you would find out on a professional golf course. 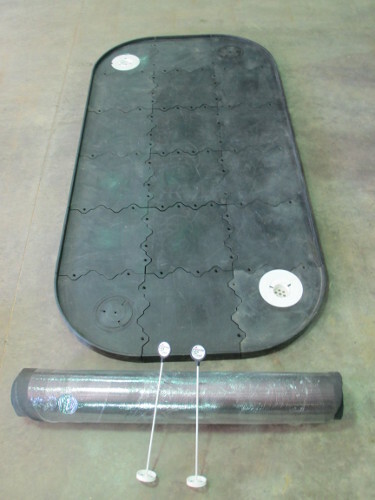 A synthetic putting green will save you not only time, but money as well, because there is no need for watering or trimming the grass blades. Over the years we have continued to improve upon our technology, based off our continued research and development of our putting greens and other synthetic turf applications. 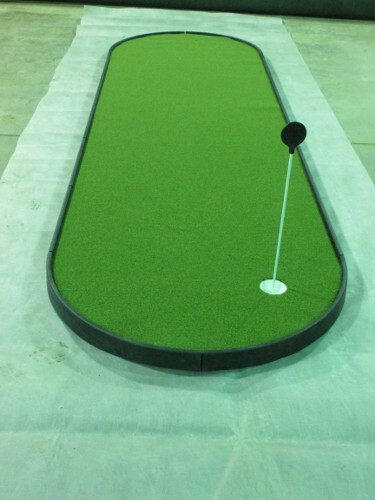 Our Artificial Putting Greens has a base constructed of tour links panels. 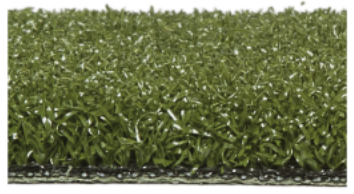 The putting surface is a high quality Northeast Bat Grass, with a ½” pile height, cross stitched nylon surface. This practice green is better than any I have seen. You can’t just roll out a capet on to your basement floor and expect it to be similar to an actual putting green. This pro type green has a true roll and was surprisingly easy to assemble. The staff was very helpful when I called with a question. Thank you! I love this product! I would recommend! I bought this for my husband for his birthday. He loves it and it will give him practice time in the winter. In the summer he warms up with it, before he goes golfing on the course. The roll feels true, which is what he loves best about it. Very well made and lots of fun! We’ve had this mat for about a year and we love it. It’s on a cement floor in our basement, and it looks great. We leave a putter and a few balls out all the time so we hit several practice shots a day. Our kids use it often and when friends/family visit, everyone has a great time with it. The ball rolls perfectly. Highly recommended. Very happy with this product. Very speed shipping. I was very skeptical of paying this much for a putting green kit, but I am glad I did. The ball rolls just like a real green on a golf course. In my experience the $20 to $75 greens in the stores or online don’t even come close. The tour link panels are essential for a true roll. And it only took me about 15 minutes to put it all together once, I decided where to put it. I’ve moved it once since I bought it and its very easy to transport. This is great for people with a bad back or weak knees. My sons likes using it for an hour before they play on a course. I told my wife it was partly for them in order to convince her that it was needed for the whole family to use. Overall I wish I would have purchased this years ago, instead of wasting my time on the cheap ones and can’t wait to take it outside on the patio in the summer. Very durable. Have this in my garage. It stays put – thanks to the panels that link together. It does not roll in the corner either. The lawn grass is very authentic.